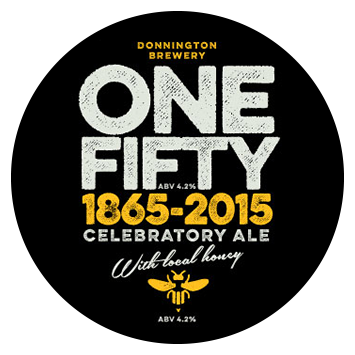 Donnington still produces its beers by much the same recipe that has always been used. Spring water (or in brewing terms 'liquor') is drawn from the spring beside the mill pond and used as the main ingredient along with barley, malt and hops. Until the mid 1960s, the barley was grown on the local estate but today it's brought as malt from Norfolk. The hops are from Herefordshire and Worcestershire. Nutty aroma with toffee and a trace of orange fruit. Sweetish, chewy, cereal malt flavour with an earthy edge and decent bitter finish. When ordering a firkin, why not personalise it with a label designed especially for your event? Ideal for weddings and celebrations! Our beers are available in all our 17 tied pubs plus selected outlets. For any enquiries, please contact us at the Brewery.